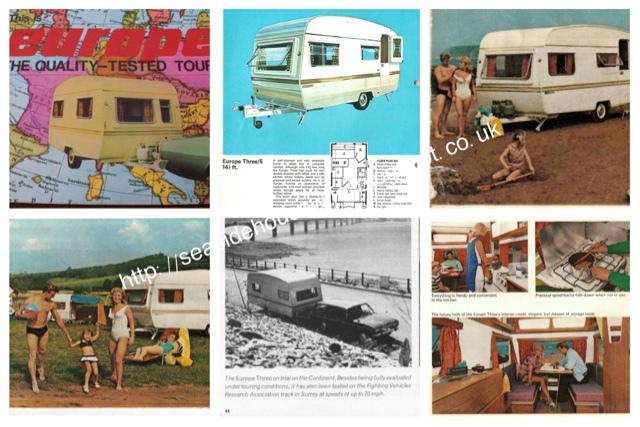 Top items to have in your Retro Caravan! 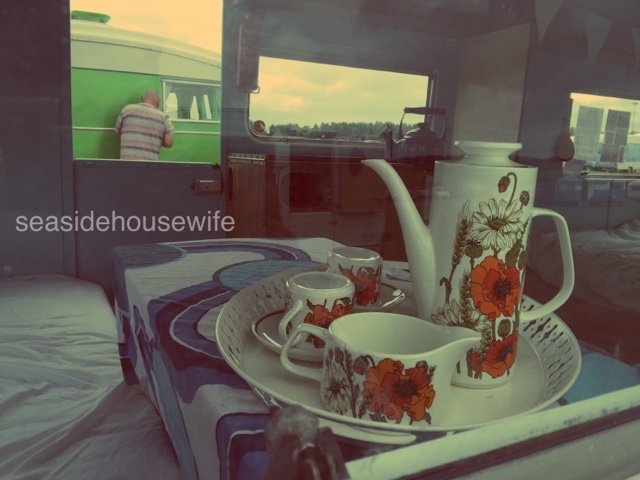 We have owned Daisy, our 1960's caravan for over a year now. We are a family of five, three children 6 years and under. 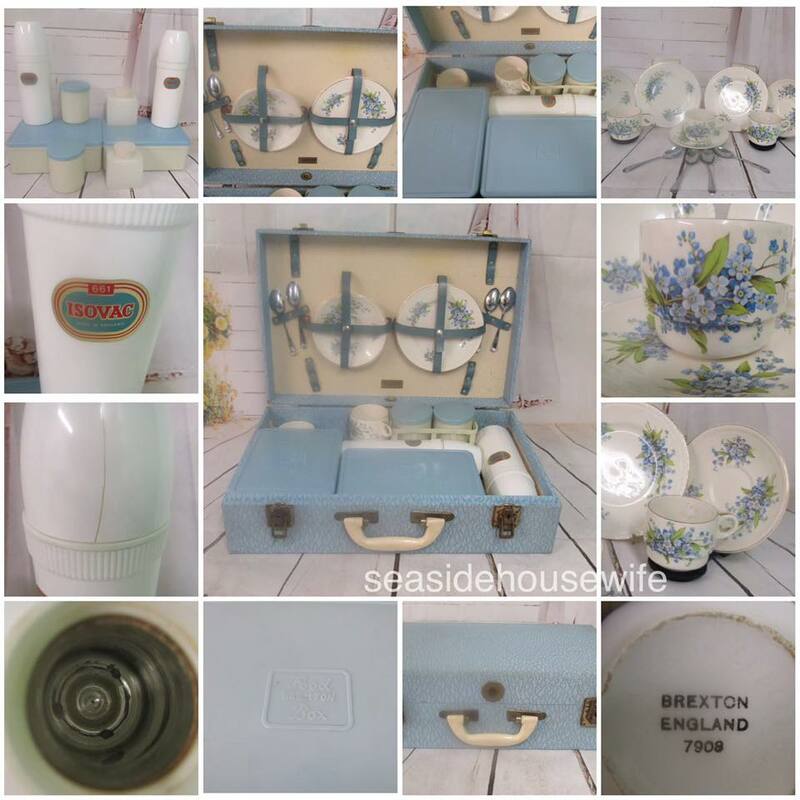 Where ever possible we have tried to match items to Daisy's age so 1960-1970's. Its lots of fun hunting for things and coming from a family of hoarders has helped to kit her out! One thing I've noticed is we have been changing from 'camping' items to just normal home items. We had started off using things we had brought for a camping, but mostly they have now been given away and replaced. I should also note, that unlike some other vans you may see at shows, every thing we buy for Daisy we use. Our budget has been tight, due to most of our funds going to her restoration. We haven't brought things just to look nice when shes on display. When we where at Retro Fest and people where amazed that I was cooking in our van (it was out of show hours) and that she was used. I explained we had just come from three nights camping and she is very much used and loved. Don't get me wrong, people have lots of fun finding items just for show days. For us, we need it to work too! A kettle, it may sound like a really simple thing to say but a good kettle will really change your holiday. Then along came this huge gem, I love this kettle so much. I brings back so many wonderful memories as soon as I hear it whistle. 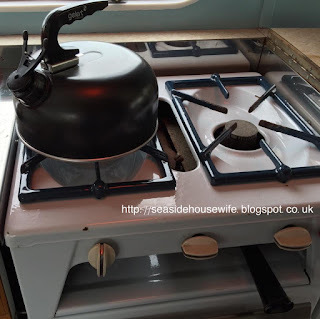 Click here for my review of this fab kettle. This this not just making a cup of coffee, this is the start to our holiday, not a quick cup of jo but waiting for that sound that its ready! I had been after a record player for years to replace my old ones. My poor records had been just sitting about unloved and collecting dust. Why a record player? 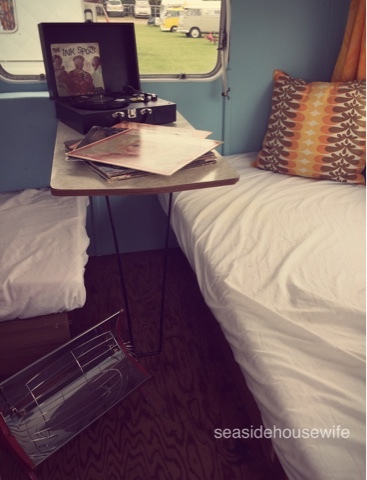 The one thing I've noticed at shows is, most of the retro/vintage caravans have a record player somewhere inside. Lets face it, there is no better sound than that of a vinyl. A field and picking out a record, is heaven. This one was such a good buy, its not a real vintage one, but very close! Click here for my review on this portable record player. 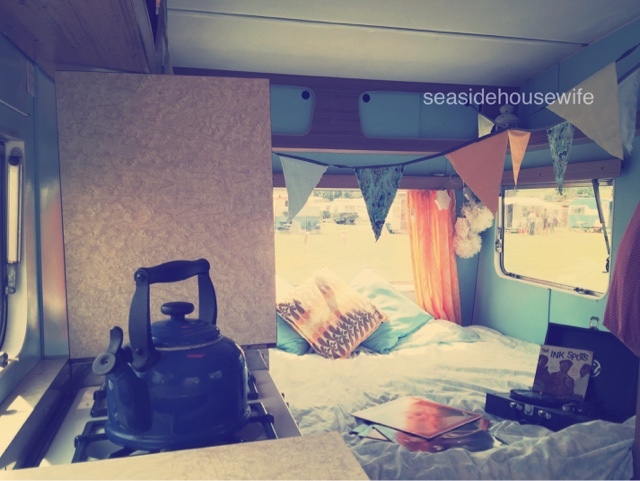 To really get the retro look in your van, its all about the fabrics! From cushions, sheets, quilts, tea towels and tablecloths. 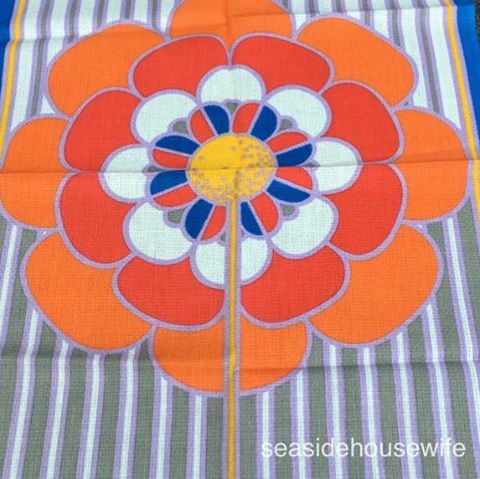 You may not have found a true retro camping/picnic table but throw a true retro table cloth over it and no one would know! I love retro fabrics anyway and already had a few bits like pinnies and table cloths. One thing about the prints from the 1960's and 1970's is there is noting thing quite so wonderful around now. Maybe the odd few, but not many. I love them! 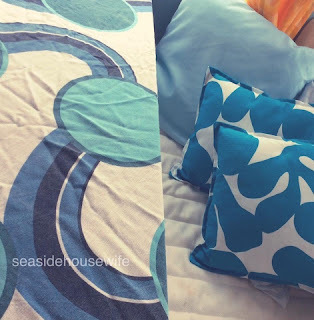 Yes I do use vintage bed sheets at home and in Daisy. To save you a lot of work, have a different set of quilts/bedding/towels/table cloths and tea towels just for your van. Our first few trips we had to nick the quilts off our beds, this may sound simple, but it was a lot more work. Say we had been to a muddy damp field for three days or a little one had wet the bed. We arrived late home and then, have to unlock the van and pull out all the bedding (no matter what condition it was in) and put it on the beds. So quite quickly I made up my mind to buy new quilts for the van. This also means, that if I did have to wash one, I wouldn't have to worry about what that child would have on their bed when we got home. Now Daisy has her own set of everything! Its fun hunting out the perfect items for Daisy. 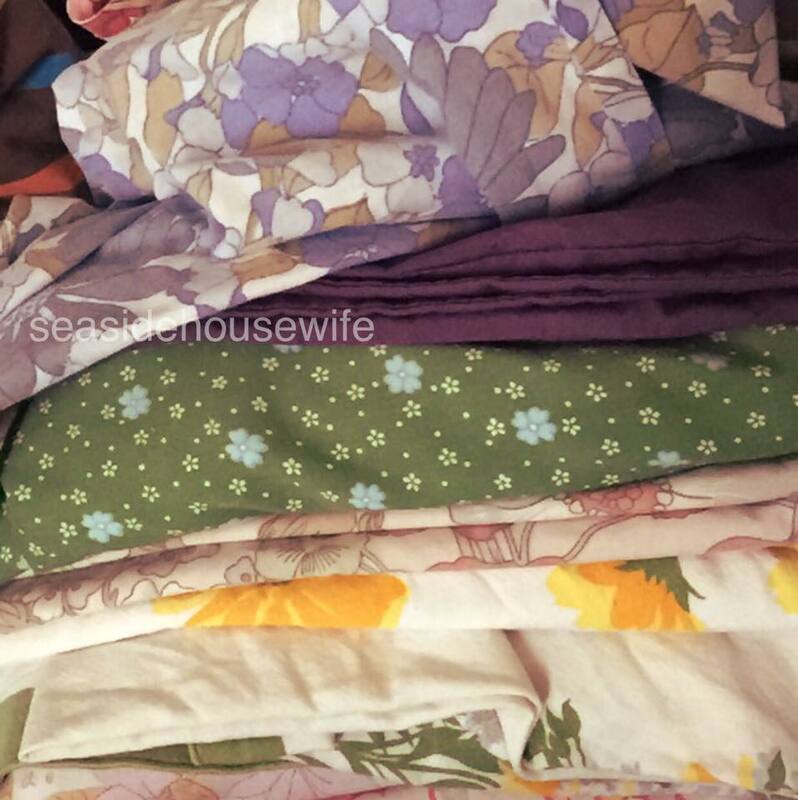 (My vintage bedding collection has grown hugely this last year. Partly thanks to being left lots of beautiful items from my Nana.) Its always a good idea to ask around your friends and family. Your Nan may have a few bits at the back of the airing cupboard you can have! Sleeping bags or quilts? Its very much down to personal preference, for us its quilts. Even when we camped in a tent, it was still sheets and quilts. 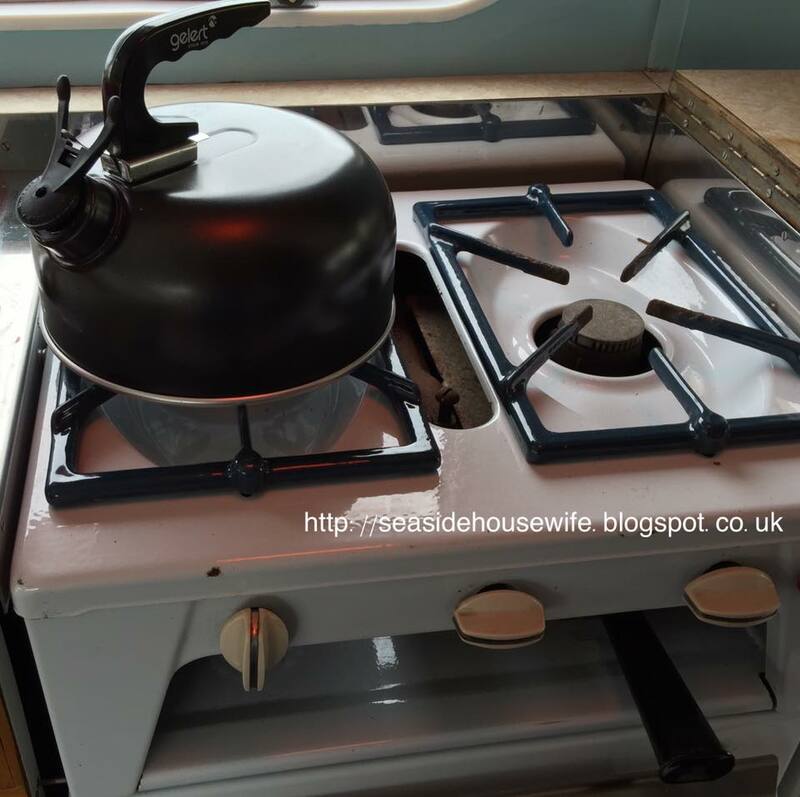 Caravans hold the heat far better than a tent and even in winter, its all about laying! So what do you need in your van? I've started to take far less towels and bedding than I did on our first trip. One quilt per bed. (When winter camping I upped this. As at home we have thin quilts, but I have brought a thicker one for the van) The kids only have a single size quilt in the caravan. Where at home they have a double, even on a single bed. Its easier to tuck in. 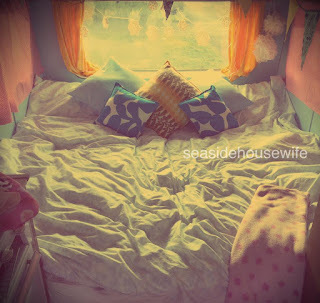 A single bed in a caravan, is much thinner (ours is) so only a single is needed. A blanket per person. Each child has their own blanket. We travel at different times, this blanket stays with them in the car. Sometimes we are hooking up to go early in the morning and its cold. This blanket goes from the house, to car, to caravan. They are all different colours so they know which one is theirs. This given them something of theirs for comfort and also an extra layer at night. Then if we arrive home late at night (they mostly travel in their pjs if this is the case) we can wrap them in the blanket to run them from the car to bed. If you have electric hook up and a heater, you will be amazed at how little 'extra blankets you need. I say one per person though as I always wrap a blanket around my self when its late at night around the fire. Tea towels, at least two. One to use and one drying. Table cloths. I have two of my Nana's and I love using them! Look at my very cool tea towel for Daisy! Its pretty much brand new! Now, a retro picnic basket is a must anyway but there is something about retro/vintage vans which just lend them self's to them! I have been looking for one for more years than I can remember, long before buying Daisy. Well I just think they are fab. At last, I have found the perfect one! I needed it to be at least a set for 4 and I kept just finding sets of 2. Now, these style baskets/cases, can range in price. From about 30-150 pounds. The more missing items it has the cheaper it will be. Am going to do a blog just about this subject, so will add the link here when I do. This is how it arrived, it needed lots of work to make it perfect for us, for Daisy! 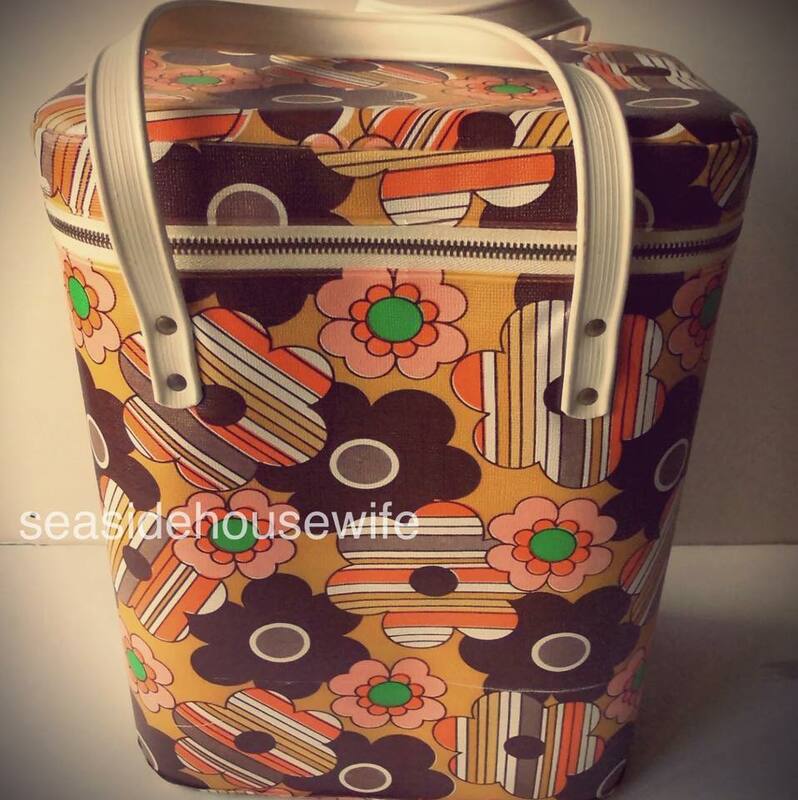 Click here see our amazing picnic set. What I love, is you never know what you may come across. There a lots of different types of picnic items out there. You have to work out which style will suit you best. For us it had to be usable, and match Daisy's colours. Check out this amazing, funky find! While searching for a picnic basket I came across this. Its a cooler bag, I love it!! Am really looking forward to using it this summer! Yes, we use real china in Daisy! I was given this beautiful J & G Meakin set for her, from my Great Uncle. My Grandparents always had real china in their caravan. Yes it does add a little weight but I love using it! 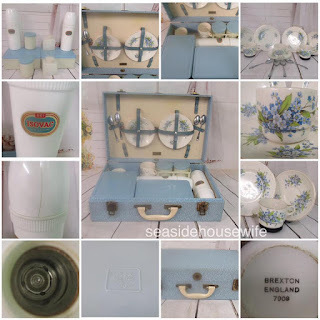 Lots of people like retro plastics/camping sets but I love J & G Meakin. I may have, sorry hubby, started collecting it! I brought some new china table wear a few years a go, and its cracked, chipped and I've thrown loads of it away. My 1960's plates from my Nana, still going strong!! There is something amazing about the different patterns you can find for your caravan. If like us you have a few minis, a good little investment is some vintage bikes! I have a beautiful vintage bike, I've had for years. So light weight and very me! 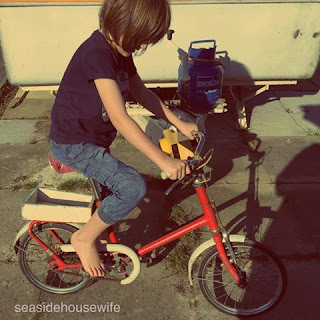 I have been looking for ages for a few bikes for my little minis, and at last I have found my first one! It needs a little work, but our oldest is so excited and straight away asked for a helmet and bell! Just three more to find...... 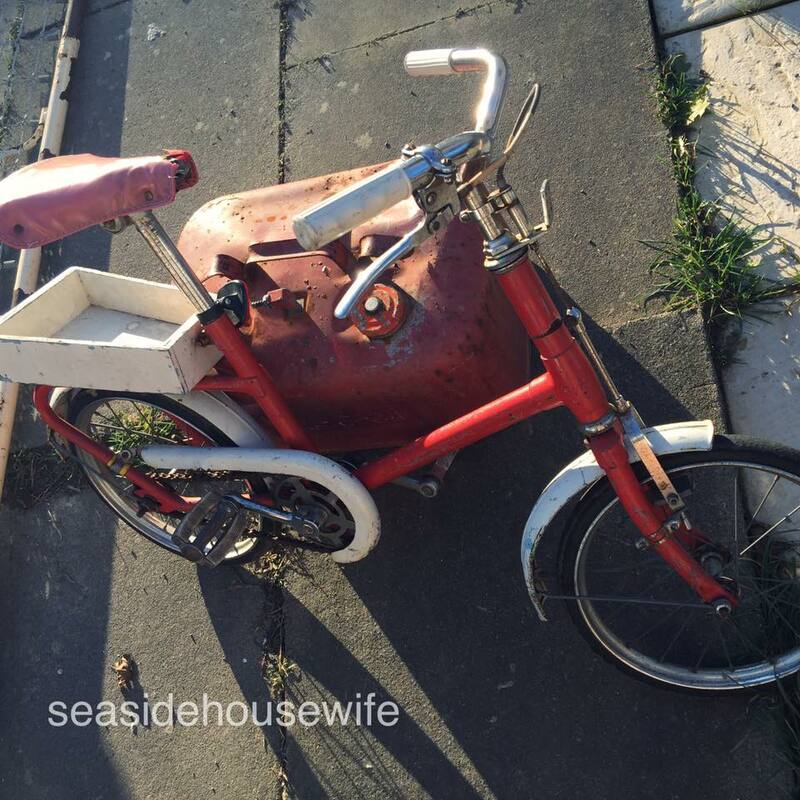 I have my old trike, from the 80's which they love and I love seeing them use it. 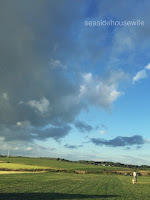 In big fields a few things to push along (we take a toy dolls pram) and ride, will keep your minis busy. Also lets face it, they will look amazing lending up against your vintage van! Am really excited for when we can all ride off on our retro bikes, in the new forest or somewhere. I quickly worked out that it was a really good idea for Daisy to have her own set of everything! (I had to borrow a can opener!) 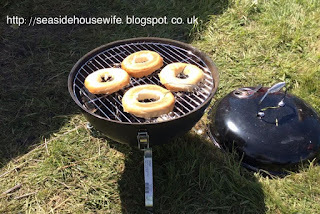 So why no go retro with your bottle opener or cooking pans!? I've slowly been collecting bits for Daisy's kitchen. Pots are a hard one, as am quite picky! I have just been given some of my Nana's pots so will take a photo soon. They are not the perfect colours for Daisy but they will be perfect while am looking for more. 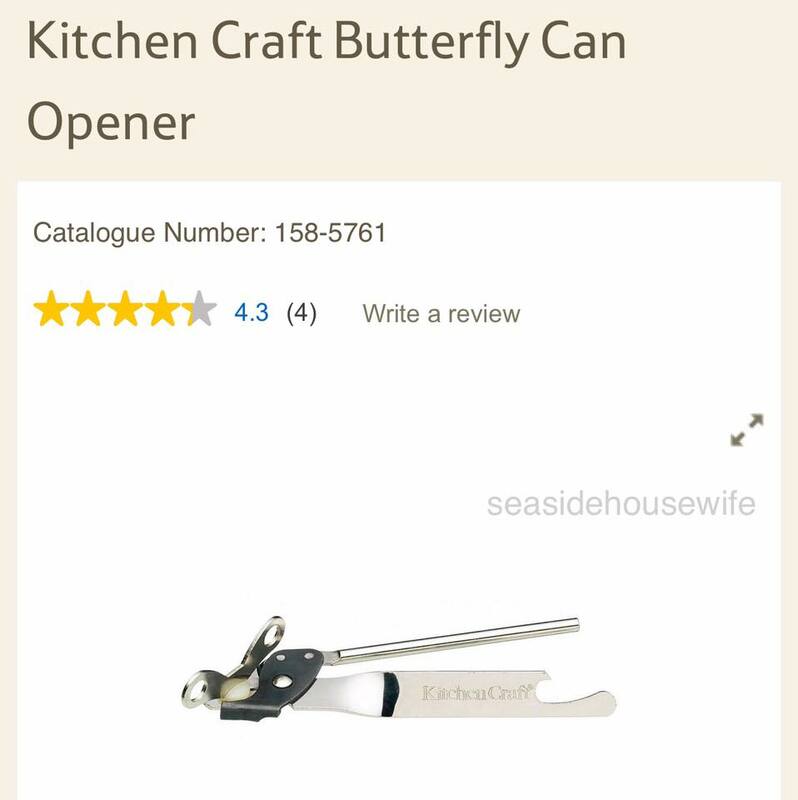 Some items haven't really changed, like a smart priced can opener is pretty much the same design its always been. 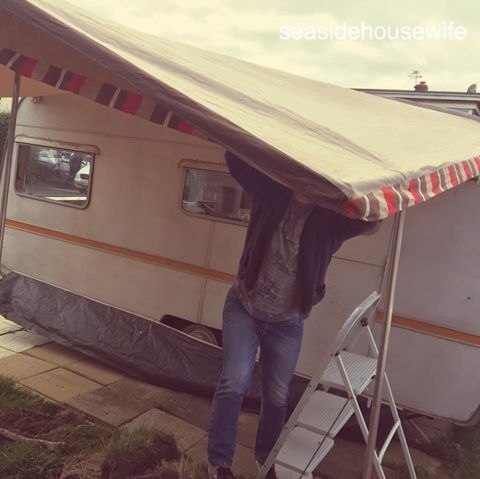 Here is Daisy's new 1970's awning being tested out by my lovely friend! That brings us on nicely to period awnings. There are some mega lucky people who, when cleaning their new to them van, find an awning hidden in a locker!! So one thing we have noticed, in the last year using Daisy is the lack of an awning. We don't mind being on holiday in the rain and cold. Not having an awning though, means you open the door straight out to the wind and rain! We have a bed right next to the door and we put any coats, extra blankets there. There have been a few times, where the floor of the van has become really damp due, to wet wellies. I have seen these great little wooden poles you can sit outside the van door and put the wellies on upside down to store. I will at some point make one. Having an awning, means we could have a no shoes in the van rule. No having to climb over wet wellies to get in and out and no losing heat and getting wet trying to get the door closed. It will give the minis a good amount of playing space too! Now, there are good things and bad things about awnings (they are called divorce in a bag!) The bad things about having a matching period awning, is they are hard to find and often damaged. When your thinking of 50 year old fabrics which have put up with wind and rain they start to get quite brittle. Having said that, I would only want one which matches, as close as possible, the age of Daisy. It would look really odd, having a brand new one on her. Also they are very, very expensive. So its worth hunting for an old one! There are now a few companies to make very good looking sun canopies. There where a few events this year, it would have been brilliant to have one. It outlines your space, and gives you shade from the sun and light showers. I noticed, that the public went up to the caravans with canopy's more. It gives them space to look at your photos, van and chat to you. Also gives you a section of your own space in a busy event. You can buy the poles and make your own. Am going to be making two in the next few months, so will put up a detailed blog about it. Am hoping it will be easy as pie....... What I love is you can pick what ever fabric you want! In any design! I will post photos of my new (retro) awning when it arrives and tips on refurbishing your awning rail! 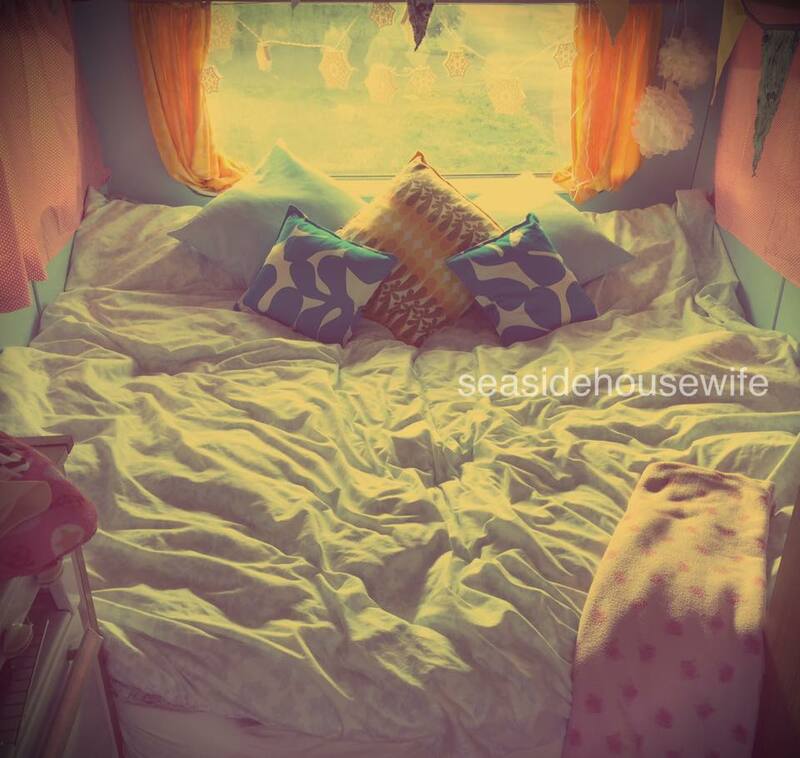 Its one of the best parts of our get aways! Hubby gets the fire going while I finish getting our minis down. Then we sit out in the stars, keeping warm by the fire. When we are away with friends, who also have minis we all sit out and toast marshmallows and jaffa cakes! We cook on it too! We brought a little cheap BBQ from tescos, its been perfect for cooking and for then using as fire. When away with the Retro Caravan Club we all sit round together, and talk till small hours. Its such a lovely thing, and at big events we have to put lots of them together! 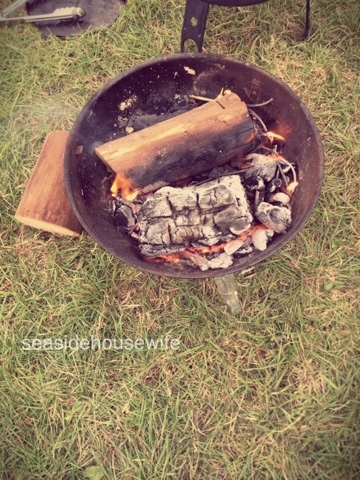 Click here for my perfect campfire meal! Our little BBQ is not all that retro but sitting out under the stars is something we see much more with the older caravans! Now I do need to talk about matching camping things, like sun loungers, chairs, tables, etc. Am still on the hunt for some, in the mean time, I found some old style chairs in tescos....I will update this when I find some more age appropriate items. So how do you store your nuts for winter? 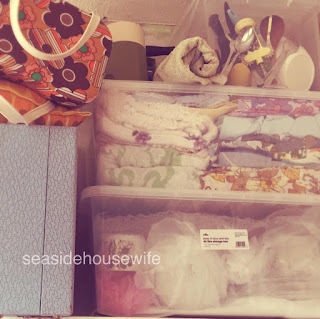 My way is clear plastic boxes with lids, I even pack the Christmas stuff away in them! I bang on about these boxes, but they are fab, stack-able, easy to see where everything is and great for in the loft or well anywhere. Where do you find all these amazing items?!! This is a hard question, boot fairs, charity shops, ebay, etsy, facebook sales groups (check out this one, In Love With Vintage where you can sell, buy, swop and share) friends and family. So many of the items we use in Daisy where gifts from family or handed down. Our little camping table was my Great Grandparents from the 60's! Its easy to be carried away and spent quite a lot on things but its also lots of fun, hunting down things for your van! I hope I haven't missed anything and I will update this blog with my new finds!! Love your blog but ..... there are quite a few spelling mistakes ! Thanks for all the info. My self and my son who has autism & dyslexia are starting renovation on a Thomson T line Glen 1968 model (HENRY) we are just starting to collect retro items for him. Had some good finds at carboots with retro sleeping bags..pans and whistling kettle which I agree is a must. He needs a lot of work but hes so cute and looking forward to using him soon. Hi, how are you getting on with Henry?